Top-Tube style frame in a one size. (Cobalt Blue, True Black). Please click here for the step over model. The frame geometry is so relaxed that you’ll feel like your flip flops never left the ground, but the bike remains perfectly balanced with a low center of gravity thanks to a down tube mounted battery pack and powerful mid-drive motor. 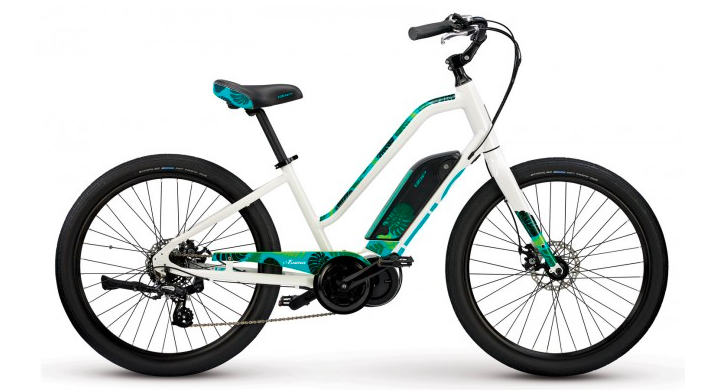 It’s an e-bike that flattens the uphill ride back from the beach and has a long-range 418W battery to power all your surf minded weekend adventures and weekday, round town errands. CLASSIFICATION - Class 1 FORK Formed Aluminum Alloy with Oversize Steerer and Blades.